Introduction: Mary Church Terrell served as a professor and principal at Wilberforce University and became the first black woman appointed to the District of Columbia Board of Education in 1895. The following year, Terrell became president of the newly formed National Association of Colored Women. She was an active writer with numerous black and foreign newspapers and occasionally the Washington Post, less accepting of her race-related topics. In 1904, she spoke at the International Congress of Women held in Berlin, Germany and was a founding member of the National Association for the Advancement of Colored People (NAACP). In 1940, Terrell released her autobiography entitled A Colored Woman in a White World, and in her later years, she helped organize desegregation activities in Washington, D.C.
Education and Career: Mary Church Terrell was one of the first black women to earn a college degree in the United States, graduating with a Bachelor in the Classics from Oberlin College and a Master’s degree four years later in 1888. In 1892, Terrell was elected president of the prominent Washington, D.C. black debate organization “Bethel Literary and Historical Society,” the first woman to take the position. In 1913, Terrell became an honorary member of newly founded Delta Sigma Theta sorority at Howard University, and she received an honorary degree in humane letters from Oberlin College in 1948, as well as honorary degrees from Howard and Wilberforce Universities. She was born Mary E. Church to a family of former slaves in Memphis, Tennessee. Although her parents were divorced, Terrell describes the arrangement as cordial and supportive even after her father re-married. Terrell was given a primary education in Ohio where she enjoyed great success, and her father supported the decision to get a higher education in the same geographical area. In describing her experience at Oberlin College, she believes “it would be difficult for a colored girl to go through a white school with fewer unpleasant experiences occasioned by race prejudice than I had.”1 Terrell was voted class poet, involved in the Aelioian literary society, given access to orators, singers, and orchestras, generally treated well by professors, and had her articles published in the campus newspaper, Oberlin Review. In and out of school, she took advantage of every opportunity possible during this fairly carefree time in her life and even visited Washington, D.C. where she would meet Frederick Douglas, a lifelong friend. Upon graduation, Terrell secured a position at Wilberforce University where she taught for two years. In 1886, she was offered a position teaching at M Street Colored High School in Washington, D.C. and began working with Robert Heberton Terrell in the foreign language department. After completing her Master’s degree in 1888, Mary Terrell took a two-year leave of absence studying in France, Switzerland, Italy, and Germany to further her language competency. Upon returning to Washington, D.C., Mary and Robert continued to work together although the relationship became increasingly personal. Terrell describes later that “…I enjoyed assisting him in the Latin department so much, I made up my mind to assist him in all departments for the rest of my natural life”. The two were married in 1891 in great celebration but faced difficulty in the first five years of the marriage since the couple had three children who died soon after birth. In 1895, the District of Columbia’s Board of Education appointed Mary Church Terrell to one of the three available positions reserved for women. Terrell was the first black woman to be a member of the board. After six years, she resigned from the board due to a conflict of interest involving a vote for her husband to become school principal. Her activities were varied including administration of a black school district and Congressional appropriations requests for D.C. schools. In the midst of her educational and personal responsibilities, Terrell attended National Woman Suffrage Association meetings and knew Susan B. Anthony. On a number of occasions, Anthony and the association allowed her to speak on suffrage and its relation to “colored women.” Her connection of the two issues led to an eventual involvement in Delta Sigma Theta. The sorority, which took part in woman’s suffrage activities early in its foundation, was formed in January 13, 1913 at Howard University, and the 51-year old Terrell was considered an honorary member. In 1892, Terrell founded the Colored Women’s League of Washington and contributed as a teacher and organizer. She was instrumental in the group’s merge with the National Federation of Afro-American Women to form the National Association of Colored Women (NACW) in 1896. Ladies from both original organizations felt she was a fair and trustworthy person, and Terrell was elected as the first president of the organization. She was re-elected then given the title of honorary president for life after completion of her second term. During her time as president, the most notable event was a Chicago convention that included an invitation by Jane Addams of Hull House for a luncheon. Although Hull House and similar groups failed to take a stand against discrimination at the time, the NACW achieved greater standing nationally and received favorable extensive press. Terrell established the Monthly Notes newsletter to promote the organization and placed an emphasis on the need for members to form kindergartens, nurseries, and mother’s clubs in black communities. Local federation chapters also developed homes for the aging, schooling for girls, clinics, and other support networks during Terrell’s tenure, and it was recognized as the leading black women’s organization in the United States. Image: Tennessee State Library and Archives. 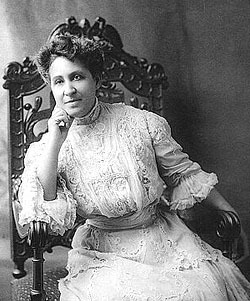 Mary Church Terrell developed greater public speaking skills which were commonly employed in addressing crowds about the progress of “colored” women, the inaccuracy of racial stereotypes, and the brutality which lynching and other practices posed against blacks. Her connection to black leaders expanded, and W.E.B. Dubois as well as Booker T. Washington invited her to their schools’ respective commencements. When Mary’s husband was appointed a judge with great controversy, some suggested that Booker T. Washington had used his influence to help secure the position for him. In 1909, Terrell became a charter member of the NAACP at a time when many declined due to fear of losing their jobs. Terrell had become well-known around the United States for her unique ability to accurately and intelligently describe the difficulties which black women faced at that time. Her husband had always been very supportive, and Robert Terrell had nothing but encouragement when an invitation came for Mary Church Terrell to address the world. Despite some financial obstacles, Terrell spoke at the International Congress of Women on June 13, 1904 in Berlin, Germany. She gained respect and notoriety for her speech’s content and form; Terrell had made the speech in German and French and given the audience a look into a world they had never imagined. Many foreign members had not realized that she was considered a “colored” person until Terrell informed them. During WWI, Terrell offered her linguistic services to the federal government and managed to obtain a low-level clerk position despite facing severe discrimination from recruiters. Terrell had experienced similar difficulties in buying a house, seeking other employment opportunities, and traveling in the south. Eventually, she resigned from the clerk position due to the racial prejudice she experienced. Terrell did not have the level of influence which she had briefly held with Theodore Roosevelt’s administration; on one occasion, she had spoken to Secretary of War Taft about suspending a motion to dismiss black troops until a proper investigation could be made. The suggestion was placed into motion within hours. Mary Church Terrell had two daughters and successfully managed a family with her husband Robert in the midst of her continued speaking, writing, and teaching engagements. Her husband passed away in 1925, and she spent her time primarily in Washington, D.C. for the rest of her life. Terrell became involved in the political campaign of Ruth Hanna McCormick who ran for an Illinois senate seat and later advised the Republican National Committee during the Hoover campaign. In 1940, she released her autobiography Colored Woman in a White World. One of the final chapters describes carrying on and her intent to stay active as she aged. Awards like the honorary doctorate of humane letters bestowed by Oberlin College in 1948 and similar honorary degrees from Howard and Wilberforce University seemed to only further motivate Terrell to action. In 1950, she and a number of colleagues became one of the earliest activist groups in a new era of civil rights. A lawsuit was filed against Washington, D.C.’s Thompson Restaurant when the establishment refused to serve them because of their race. D.C. segregation was officially challenged and declared unconstitutional in 1953, and Terrell had helped organize sit-ins, pickets, boycotts, and surveys around the city leading up to the ruling. Many regarded her leadership as key in this early court battle to desegregate America. She also successfully lobbied the National Association of University Women to admit blacks while in her eighties. Terrell died at the age of 91 just days before the Brown v. Board of Education ruling that reversed the “separate but equal” stance that she had seen come and go. Mary Church Terrell’s boundless energy had been shaped by pioneers like Frederick Douglas, brought into the struggle for women’s suffrage and the welfare of black women, and culminated in her early contribution to a movement that would directly challenge formal segregation across the country. Terrell, Mary Church. A Colored Woman in a White World (pp. 45, 102). Mary Church Terrell House National Park Service, U.S. Department of the Interior website. Vol. 67, No. 1 (Spring, 1982), pp. 20-33. Jones, B.W. (1982). Before Montgomery and Greensboro: The Desegregation Movement in the District of Columbia, 1950 – 1953. Phylon (1960-), Vol. 43, No. 2 (2nd Qtr., 1982), pp. 144-154. Mary Church Terrell’s autobiography: A Colored Woman in a White World. Amherst, N.Y. : Humanity Books, 2005. Terrell, Mary Church (1901) The Progress of Colored Women. Library of Congress. Mary Church Terrell Papers. Oberlin College Archives. Mary Church Terrell Papers, 1884-2004. Dignity and Defiance: A Portrait of Mary Church Terrell (documentary film). Terborg-Penn, R. (1998). African American Women in the Struggle for the Vote, 1850-1920. Indianapolis: Indiana University Press. Delta Sigma Theta was founded January 13, 1913. Her “friendship” with Anthony is an overstatement. My Sorority, DELTA SIGMA THETA, was founded on January 13, 1913.